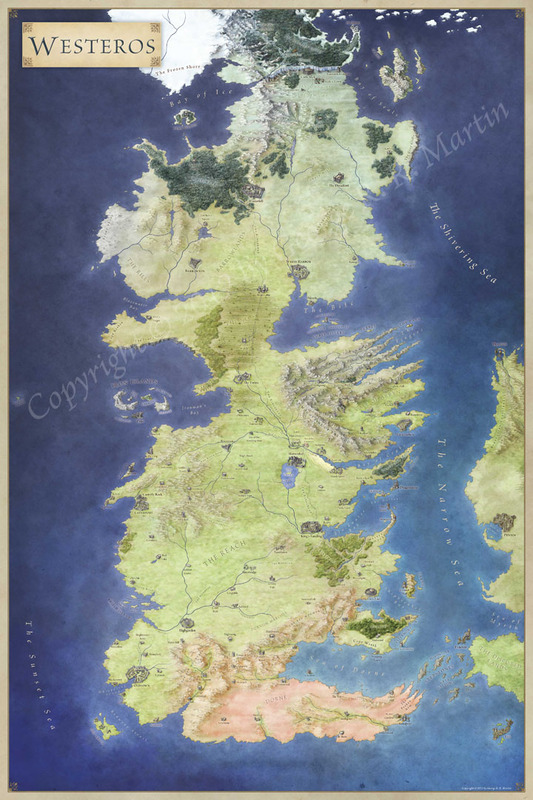 Where Westeros is detailed down to the last inch here the map is almost sketched in by the Maesters – with places such as the Land of the Shrykes, the Cities of the Bloodless Men and the Grey Waste. This is a map of vibrant colours – from the thick green patchwork farmland of Yi Ti and it’s verdant rainforest, to the purple-black jungle of Ulthos, pink ghost grass of Asshai and the reds of the Bleeding Sea and the Red Waste. The terrain is epic – built on a grander scale than the West. Perhaps this is the natural result of the exaggeration of travelers coming back with tall tales, or perhaps the Bone Mountains really are this large, perhaps the Great Sand Sea could swallow nations. The roads tell their own story. 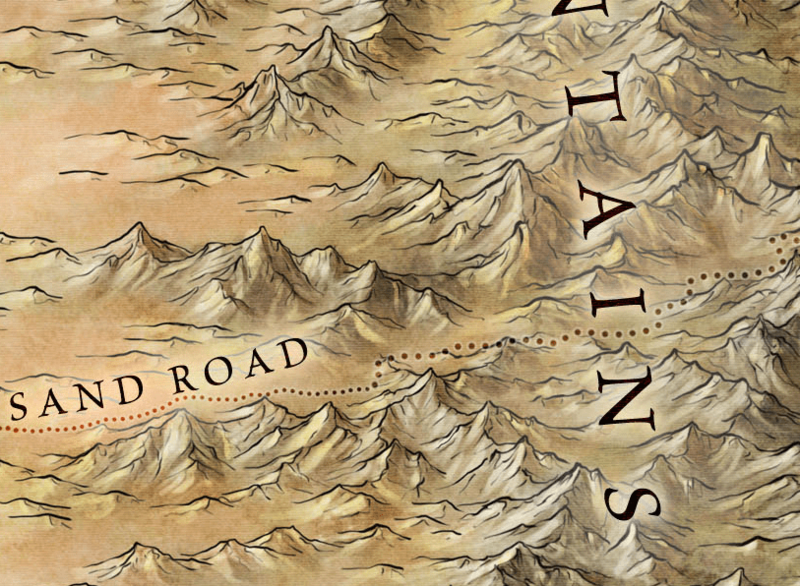 Three routes penetrate the Bone Mountains – the Steel Road, the Stone Road and the Sand Road. 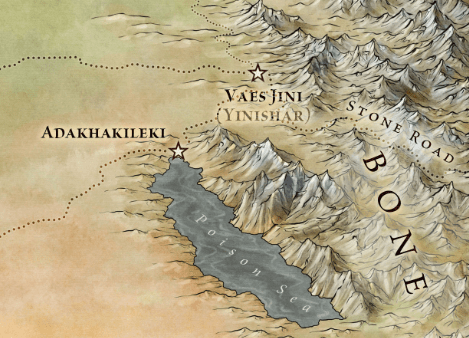 They connect the lands we’re familiar with – the Dothraki Sea, Qarth – with the unknown and exotic lands to the East. Finally, far to the East, at the tip of a peninsula dominated by a towering mountain range, and on the edge of the plains of the mysterious Ghost grass, sits Asshai. 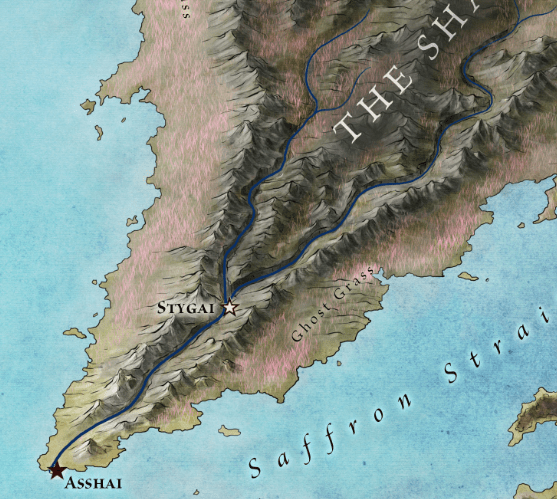 The ruined city of Stygia is upriver, nestled in the river valley, but Asshai stands alone. 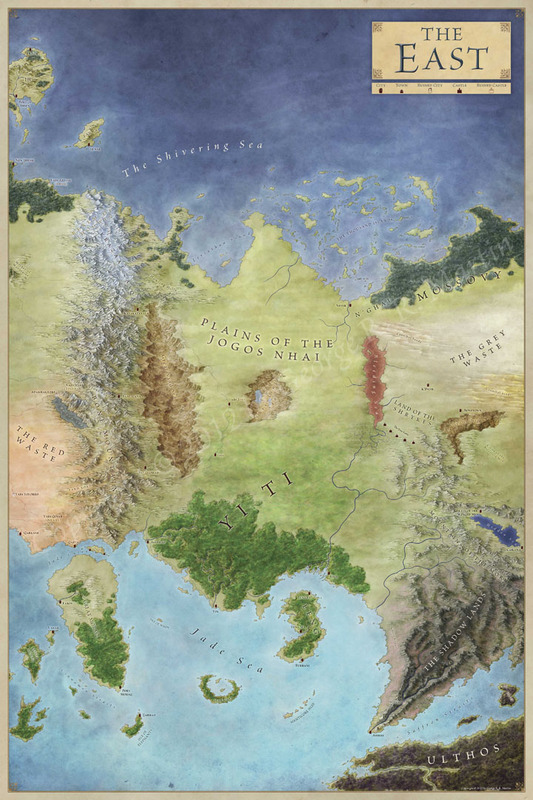 This map, along with the others, can be picked up in full size in the Lands of Ice and Fire poster map folio. This map work is seriously brilliant John. I’ve added the mappack to my wishlist – perhaps the family will be generous. It was a lot of fun to draw :). Glad you like it! I got here through westeros.org and what beautiful maps I found of my favorite book series. Amazing work! Is Carcosa a reference to Ambrose Bierce? Not that I know of, but I’d defer to George on that one. Is Great Sand Sea a canyon or dune? This is a freaking awesome map. I really hope some characters visit Ulthos or Sothoryos. I hope so too! But I think we might be staying in continental Essos, and west of the bond mountains for now. Maybe this is a FAQ, but I notice the biggest difference between your map and others’ is that yours extends past the bone mountains as opposed to most others, which stops at the Jade Sea. Are the other maps wrong? I’m confused about this mysterious Jade Sea. I mainly ask because I’m drawing a full sized GoT map inspired by your art as a gift for my girlfriend and I know she’s gonna ask about that. Thank you for making this. I’ve learned a lot about drawing maps from this website. Yes. The other maps are wrong. This was the first map to extend into the East, and is created from George’s hand drawn map of that region. It’s the canon map. There’s a slight sophistication that the world of the show and the books are a little different, so HBO maps will always be different.